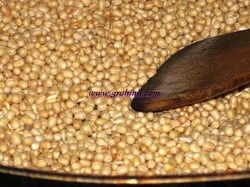 Roast urad dal and rice until golden color in a pan. Let it cool. Grind the roasted dal coarsely in a mixie and keep it aside. Grind sugar and cardamoms and make fine powder. 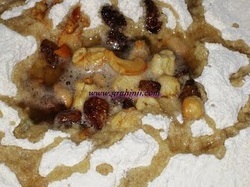 Now heat a table spoon of ghee and roast cashews and raisins. 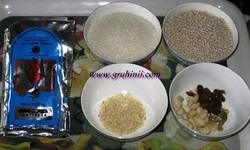 Now take the grounded urad dal powder, sugar powder in a plate and mix well. Heat ghee and pour it in the mixture. MIx well and make lemon size balls. Tip: If you want to use less ghee or face difficulty while making laddu's add 2 table spoons of (boiled and cooled) milk. You can make the laddu's easily.